This is not just an affair. This is a love story. And more. With over 200 breathtaking photos this book will take you on an Italian adventure like no other. From showcasing places seldom seen by visitors, to creating recipes of typical Tuscan food, to learning about Chianti and super Tuscan wines, to meeting the Italian people and their soft, slow life – you will fall in love with Italy after reading this memoir! 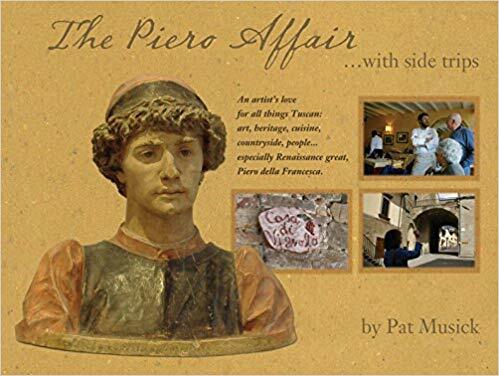 “The Piero Affair…with side trips” is also an art book that tells the story about Pat Musick’s forty-five years of adventure in Italy and her love affair with the great Renaissance painter, Piero della Francesca. Her intense fondness for Piero’s art and architecture has taken her to places more amazing than one could imagine. The book is filled with great photos of the Tuscan countryside, Etruscan ruins, picturesque views of hills and villages, small museums, restaurants and trattorias, delectable shots of authentic Italian food - all these and more! Unlike similar books and stories, Pat will also take you to an adventure deep within. Like how her intense fondness for her artist hero grew into something more. As you move through the pages of the book, you’ll see how an artist’s work can inspire and generate great love. Her beautifully written words about the artist will send you on a search about this painter - just like this writer did! Who knows, all the stunning photos might inspire you to book a trip to Tuscany today. After reading the book, you will realize that it wasn’t just a memoir, art or travel book. It wasn’t just an adventure. It wasn’t just an affair. It was love. Perhaps more than that.